Cucumber Emelia is ideal for both outdoor and greenhouse growing. 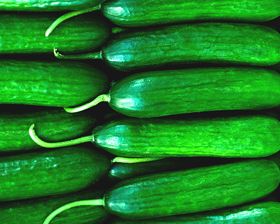 Plants produce a heavy crop of slightly spined dark green cucumbers 20cm long with a crisp, juicy flesh. Cucumber Emelia has excellent powdery mildew, weather and scab resistance. Sowing seeds in February to May 1cm deep, in pots of free-draining compost. Place in a propagator and keep at a temperature of around 20-25C until germination, usually 5-7 days.